Boy am I having a nice evening. I’ve downed a bottle of red and am working on a bottle of white. Not a combo that makes for a chipper morning, I’ll admit, but right now I’m feeling no pain. To top it off, I’m watching “40 Year Old Virgin,” the hilarious Jud Apatow movie starring Steve Carell and Catherine Keener. I saw it in the theatre back in 2005 and it’s just as funny now as it was then. I’m not a drinker, but I’ve been craving a nice bottle of wine for over a week now. All that’s missing is a nice girl for company. Anyway, the point is, I was saving this photo for tomorrow but I really like it a lot and want to post it now. 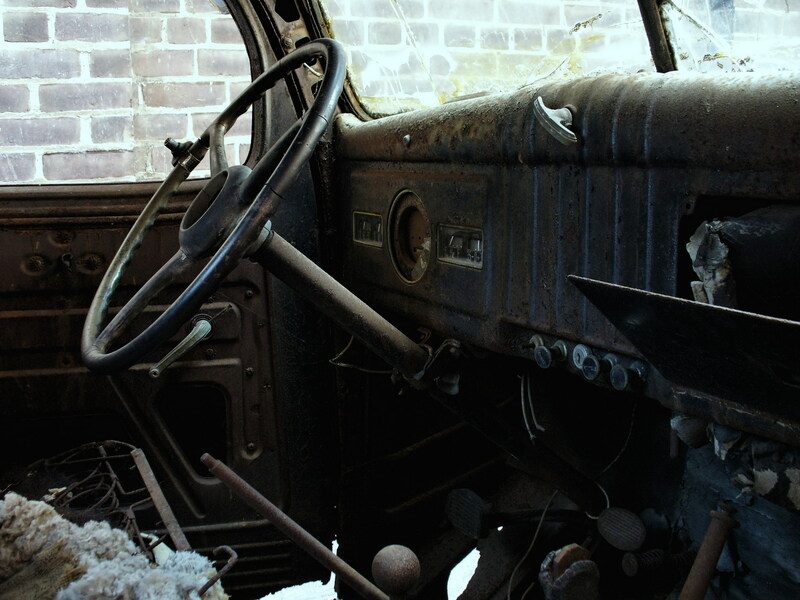 It’s the interior cab of that rust bucket of a truck from the distillery district. Hope you like it. This entry was posted in Distillery District, Downtown Toronto and tagged Art, Digital Photographs, Digital Photography, Distillery District, Downtown Toronto, Favourite, Industrial, Photo Art, Photographs, Photography, Photos, Street Photos, Toronto, Urban, Vehicles. Bookmark the permalink. Jude apatov is a brilliant director. Yeah, it’s a great flick. Did you see Funny People? I love that movie. The opening five minutes is hilarious beyond belief. I am indeed a film buff. If I’d started a blog about movies the word count would be double what this one is. I love film from all eras. I really enjoy old black & whites films of the 40s. My fav’ movie is probably Frank Capra’s “It’s a wonderful life.” I watched it the other night. Never fails to bring a tear to my eye. Best movie of the year is Quentin Tarantino’s Inglorious Basterds. I like to get to know people who can teach me things I don’t know much about. Let the rush of those holidays go by and then we sure will. Oh this photo brings back memories of the old International pick up truck that ‘lived’ in the driveway for years and years until the man who occassionally drove it passed it on. As for Avatar–want to see it for the medium but having some trouble with what seems to be the theme—why? Because in reality there are Indigenous People fighting for survival around the world NOW and their struggles could benefit from the exposure this movie gets for being escapism. Explore Amazon Watch online if in doubt or curious. Any wonder I’m having some trouble with the ‘holy day’ season? Hmm…back to photo–did you take other shots of this truck? Thanks. And yes, I’ve got a couple other photos of this truck. I’ve posted a couple already but have one more that’s a full shot of the truck. I’ll post it later.